These Perspex Acrylic Poster Frames are a simple yet effective way to display your poster, menus, memos, photos and more any where on the wall in your interior location. These Perspex Acrylic Poster Frames are a great and simple way to promote your business, company or cause by displaying your posters, photos, menus, memos and more! Simply hang these stylish and modern Perspex acrylic frames on the wall anywhere in your interior location and watch as they not only showcase your graphics but brighten and decorate your space. With these frames available in sizes A4, A3, A2 and A1, you can pick a frame size suited to you and your location. 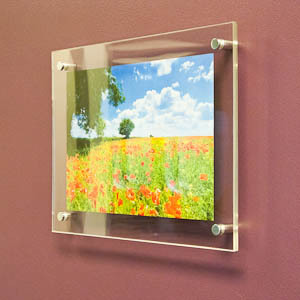 These wall mounted Perspex acrylic poster frames are popular with schools, colleges, universities, libraries, NHS, waiting rooms, reception areas, offices, hotels, cafes, restaurants, leisure centres, museums and many more!